How To Know When To Replace Your Video Surveillance System | Calgary Alarm Inc.
Video surveillance systems offer numerous benefits to both homeowners and business owners alike, including small and large businesses. Video surveillance systems provide an extra layer of security and protection by deterring crime. The recordings are also an invaluable asset in the event that an emergency unfolds. For homeowners, video surveillance allows you to monitor your home from wherever you are, allowing you to keep tabs on children, pets and your home while you are away. The peace of mind that video surveillance provides is priceless. For business owners, video surveillance allows you to keep your employees safe as well as protect your assets. Video surveillance systems are a very cost-effective alternative to full-time security guards. For those of you already onto the power of these systems, here are some tips to determine if your video surveillance system is ready to be replaced. Eventually, all video surveillance systems will likely begin to malfunction simply due to their age. This is actually one of the most common reasons why people replace their systems. In any case, if you’ve had your system for a while and the technology is malfunctioning (for example, perhaps your system is not recording things properly), this is likely a sign that you need to replace your system. Don’t wait to replace it! Pro Tip: schedule regular maintenance for your video surveillance system in order to keep it in peak condition and lengthen its lifespan. 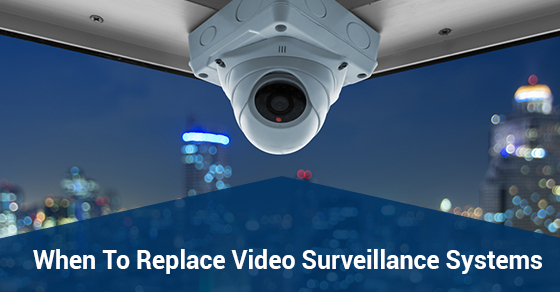 It is more cost effective than ever before to simply replace your video surveillance system as opposed to upgrading an older system. If you are expanding your business, take advantage of the extra savings and simply replace your system. Current video surveillance systems are much smarter than previous ones. You will make the most out of your system by utilizing this new technology. In fact, if your system is old, you are simply not using your system to its full potential. From remote capabilities to better image quality to the reduction of false alarms via video verification to digital storage, it is in your best interest to use these new systems. As one of the best security alarm companies in Canada, consider Calgary Alarm for your choice of state-of-the-art yet affordable video surveillance systems. Contact us today for more information.